Today's custom wallpaper imagery inspiration is one that is ever so near and dear to us: classic video games! As kids that grew up in the mid-eighties, the huge explosion of the popularity of video games was positively narcotic. The leap from the Commodore 64 to the Atari was inspired, and we never looked back. 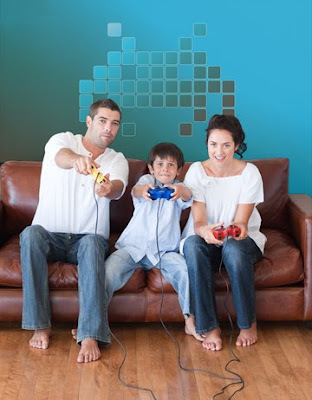 A custom wall mural featuring classic video game imagery would of course be perfect for a game room. There are many ways you can end up when using vintage graphics as your starting point. As in the inspiration room, we used an alien craft from Space Invaders as the subject. While maintaining the 8 bit look, we dressed up the design with modern color choices and a subtle gradient. Custom wallpaper allows you to decorate with such freedom. Surely, there's very few stores you could walk into and purchase vintage video game wallpaper. While the look in the inspiration room is more of a mural, the design could easily be repeated out to create a custom wallpaper pattern. The colors can be tweaked to the nth degree, guaranteeing your wall mural will fit seamlessly with your current decor scheme.